It's a big and complicated topic. You could easily spend a semester studying it John did but this overview should give you a sense of how it all works. The most important thing to understand is that each film is accounted for separately. 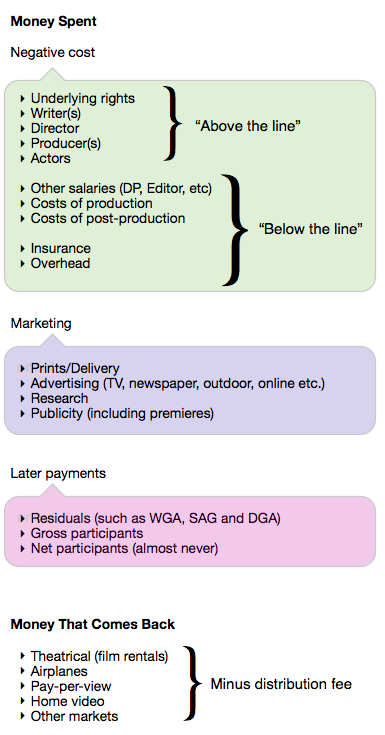 Studios charge distribution fees that earn money for the company without paying down the investment in each movie. That's how Theoretical Pictures can turn a profit even when each of the last 20 films it has released shows a loss. John couldn't remember the name of it (The Paramount Decree) but it's worth reading up on the 1948 court decision barring studios from owning movie theaters. Not only is it a fascinating anti-trust case, but it greatly influenced how the modern film industry works. UPDATE 11-17-11: The transcript of this episode can be found here.